How do you handle caterpillars? I am always so afraid that they are harmful. All the hairs seem like a warning sign. The white one we found, I got it to crawl onto a stick and then put the stick in a baggie until we got home to put it in the jar. How do we know if the caterpillar is safe to handle or harmful? 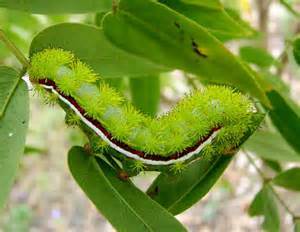 There are only two really painful caterpillars in eastern north america(that I know of), the puss moth and the io moth. There are several others that can cause a rash of other symptoms for sensitive people. I perosnaly have never gotten a rash or other symptoms from the caterpillars which this is known from. The io moth. This is a medium sized silkmoth(very beautiful). The caterpillars are fairly painful, like nettles except they last longer (I have felt it). The puss moth looks soft and fuzzy but under the hairs are painful spines that cause very painful rashes (I have not felt them). 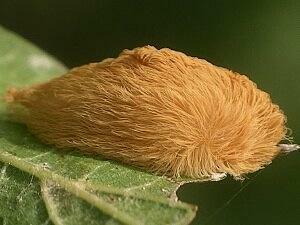 The caterpillar you found is a hickory tussock caerpillar. It is one that can cause a bad rash for some people. I have handled them with no resulting rash. However, be careful with the cocoon. I accidentally smashed an empty one against my leg and it was very itchy. Thank you again for the information. We have not touched the cocoon. The most I did with it was pick up the stick he wove it on, cleaned out the other leves and frass, then put it back in the jar.